Real estate investment is a consistently hot news topic. Open any newspaper or news website in Canada and coverage of the real estate market is easy to find, particularly in Vancouver and Toronto. Fortunes are made investing in residential and commercial properties. Speculation, offshore investors, bubbles and REITs are cocktail party fodder. Enter real estate crowdfunding – offering the promise of exciting new ways for Canadians to become mini land barons. Real estate crowdfunding is projected to climb to $2.57 billion globally in 2015 up from $1.01 billion last year and $396.4 million in 2013, according to industry researcher Massolution. This makes real estate one of the hottest sectors in the global crowdfunding industry sized at $16.2 billion overall in 2014 and projected to exceed $32 billion in 2015. On September 9, 2015, Canadian platform NexusCrowd launched Galleria, a Mississauga shopping mall project. In less than a month, $8 million of the $8.2 million campaign target has been committed for the project. Real estate crowdfunding in Canada is still in its infancy and lags behind the other sectors identified in Part I of this series. In Part III below we break down the real estate crowdfunding story so far and offer a sneak peak of what’s just around the corner. In this three-part series, we examine whether “conservative” Canadian business culture is having a negative effect on equity crowdfunding taking hold in Canada. Part I in the series investigated the market metrics and traction so far in Canada: Read it here. Part II investigated causes for market underdevelopment in Canada and lessons from other markets: Read it here. What is fueling the growth of real estate crowdfunding platforms globally? Unique Benefits for Developers and Real Estate Companies. We discuss each of these factors in more detail below. Real estate is an investment category the average investor believes they understand and know without assistance of an investment professional. Real estate is also a “hard asset” investment. Investors take comfort in the fact they can physically visit and see their investment in a real estate project. Real estate investments also provide a 10% average return with a 2-3% volatility. Although potential returns are lower in real estate than many other sectors, so is the risk volatility. Investors like steady returns with low risk. Real estate projects have also had a long history of syndication worldwide. Real Estate Investment Trusts (REITs) and Real Estate Limited Partnerships (RELPs) are common syndication vehicles institutional and high-net-worth investors are familiar with in North America. Crowdfunding is a new way to syndicate real estate investments; a sector investors are already comfortable investing in. Crowdfunding provides more transparency and openness than existing syndication models, which makes it attractive to investors and those seeking capital. Platforms like Patch of Land (USA) now claim an average blended rate of return of 12%. Traction is also evident for international platforms like Prodigy Network (USA, South America), Companisto (Europe), CoAssets (Asia) and others. Real estate funding platforms are more than a listing service of properties and projects available to potential investors. Successful platforms focus on specific geographic markets and asset classes. They offer opportunities to invest in a local contractor’s latest housing flip through to multi-million dollar resort and commercial developments. Investments may take the form of a direct or indirect investment in debt or equity participation in a real estate project. Funding platforms provide tools to enable investors to find and compare these different opportunities quickly and efficiently. Algorithms and big data analytics make the platforms smarter and enable faster workflows and approvals. They streamline the investment process by utilizing online deal rooms and subscription agreements, electronic signatures, and payment systems. They strive to make the investment process as frictionless as possible enabling quicker closings, and in theory, faster access to investment returns. Investing in real estate securities through an online funding platform provides investors with a number of other benefits beyond attractive returns, flexibility and speed. Investors are able to diversify their risk profile in this sector by choosing to make a number of smaller investments in different geographic markets and asset classes. They can chose to invest in specific individual real estate projects of their choosing or a pool of projects as part of a RELP or private REIT. Real estate investors, who are familiar with underwriting individual properties, assessing value and modeling cash flows, can step into the next layer of real estate investment by leveraging the knowledge of a larger pool of investors or portfolio management group. The elimination or reduction of the need for road shows, registered sales representatives and legal costs reduce the cost of investment and increases returns. Investment volatility in these types of private real estate investments is limited to changes in net asset value and interest rate unlike public REITs, which are also subject to stock market volatility, which moves independently of the other two factors. 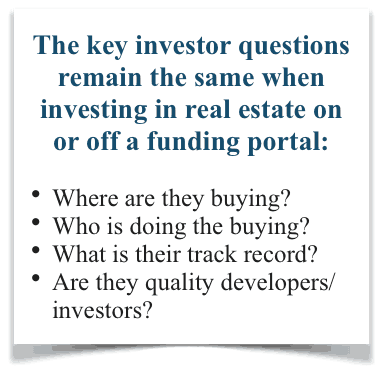 Real estate developers and companies are constantly raising capital. Equity requirements on new projects in 2015 remain between 50% and 65% on average worldwide, with most lenders requiring some form of construction guarantee. Secondary real estate cities outside of core gateway cities such as New York, London, Tokyo, Los Angeles, San Francisco, Paris, Hong Kong, Sydney, Seoul, and Shanghai continue to provide opportunities for yields in markets and asset types that fall farther along the risk curve than those available in gateway markets that are saturated. Funding platforms allow developers and other real estate companies’ access to a new pool of accredited and retail investors at a much lower cost than traditional funding avenues. It also allows them to obtain community support for projects that may have otherwise faced resistance or low market acceptance. Owners become customers and vice versa in a variety of real estate sectors. An example of this last benefit is the online funding campaign of Kitridge Hotels & Resorts of its Hard Rock Hotel Palm Springs on Realty Mogul in July 2014. A total of $1.5 million in equity was raised in the offering to refinance and renovate the property. A small amount in the real estate world. What the offering did, however, in addition to providing capital, was secure significant media attention for the hotel as the first-ever equity crowdfunded hotel deal in the US. It also provided VIP benefits to the 85 investors who participated in the offering such as free use of hotel owner poolside cabanas, a 25% discount off best room rates, free room upgrades and more. What is the story so far in Canada? Only two platforms are currently active in real estate crowdfunding in Canada. Optimize Capital Markets has offered access to real estate investments for several years, the last couple via its platform The OCMX marketplace. However, their current deals are for funds, development companies, or related technologies not specific properties. NexusCrowd recently launched their platform and first project Galleria in September 2015. The platform focuses on accredited investors. Its first project is a $100 million development project for a two-story, 238,000-square-foot (23,000-square-metre) mall to be anchored by Korean grocery store Galleria Supermarket, which also has a 50 percent stake in the development. Closely held TerraCap Investments Inc. owns the remaining interest. NexusCrowd will aggregate investors into a single purpose Limited Partnership that invests directly into the real estate providing “beneficial ownership.” The timeline for the project is to start development in January 2016 and complete by December 2017. At that point, similar to the structure on other platforms, the limited partnership vehicle created for the financing will be liquidated and dissolved and the investor returns distributed. The target internal rate of return (IRR) is 15-20%. Fundrise also recently announced that it was opening US real estate deal flow access to Canadian investors but not for developments in Canada. Why is real estate crowdfunding so underdeveloped in Canada? Given the advantages outlined so far, why is Canadian real estate crowdfunding progressing at baby steps when there is a full out sprint elsewhere? Perhaps it is more of an issue of ready access to financing already in place more than a cultural problem. Canadian developers and real estate companies are currently using Canada’s existing accredited investor and offering memorandum exemptions to sell their securities as an exempt market dealer (EMD) or through third party EMDs. Real estate issuers, mortgage investment corporations, and funds are the three primary users of the offering memorandum exemption in Canada, which is crowdfunding off-line. Issuers can raise capital from anyone resident in Canada, other than in Ontario, if they provide an offering memorandum in the required form. Real estate issuers are raising significant capital under these two exemptions. In 2014, private issuers raised $8 billion in British Columbia under the accredited investor and offering memorandum exemptions. Private investment funds accounted for $5 billion of that amount. Real estate issuers and mortgage investment corporations accounted for a large percentage of the $3 billion raised by all other issuers in British Columbia. In Alberta, private issuers raised $4.2 billion in 2014 under the accredited investor and offering memorandum exemption. Real estate issuers accounted for approximately $500 million of this amount, down from $1.2 billion raised in 2013 by real estate issuers. In Ontario, approximately $3.8 billion was raised under the accredited investor exemption by real estate issuers.